How to cook sweet potatoes in an instant Pot electric pressure cooker! It’s very easy, and of course they are gluten free, paleo, whole30, and vegan and vegetarian! Sweet potatoes really are one of the best and tastiest ‘superfoods’ out there and have many health benefits! They are a great source of vitamin A, vitamin C, manganese, copper, pantothenic acid and vitamin B6. Additionally, they are a good source of potassium, dietary fiber, niacin, vitamin B1, vitamin B2 and phosphorus. 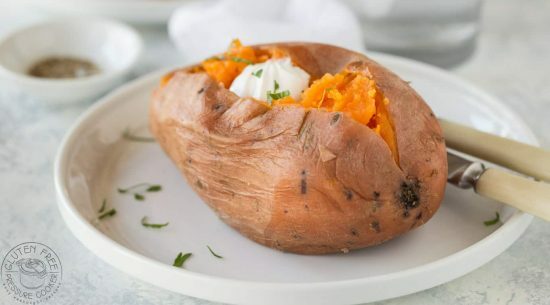 It’s a breeze to cook whole sweet potatoes in your pressure cooker, and much faster and simpler than turning on the oven to do it! You need a steamer basket or trivet that is suitable for use in a pressure cooker, otherwise your potatoes will be sitting in the water and that’s not ideal. The cook time will vary depending on the size of the sweet potato and whether it is ‘fat’ or ‘skinny’, I’ve made a simple chart to show average cook times, but you may need to adjust these. 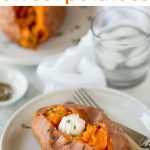 What to serve with baked Sweet Potatoes? My kids love to eat them with either butter, sour cream or cheese, or sometimes all three if I’m not looking! 😉 I love to add a little homemade chicken salad on top of mine, or if I don’t have any of that ready I just use a little butter, salt and pepper. If you’ve never cooked an Instant Pot Whole Chickenthen now is the time to do it! This post has detailed instructions including a guide for the weight of your chicken so you’ll know how long to cook it for. Have you tried my Pressure Cooker Italian Wedding Soup yet? It’s unbelievably quick to make and is perfect for lunch or dinner. Or how about my pressure cooker Irish Stew? This recipe has been a favorite around here for years, but I just recently perfected it for the pressure cooker. And lastly, here’s a fabulous recipe for Pressure Cooker Pumpkin Pie Steel Cut Oats,it’s good any time of the year!! 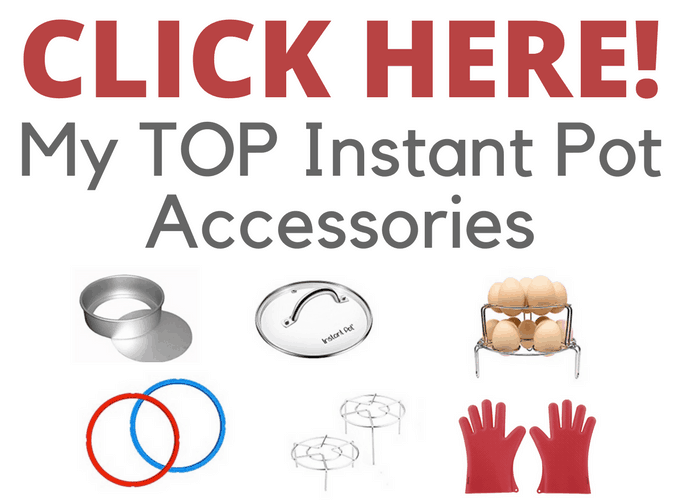 Add 1 cup of water to your Instant Pot or other electric pressure cooker. 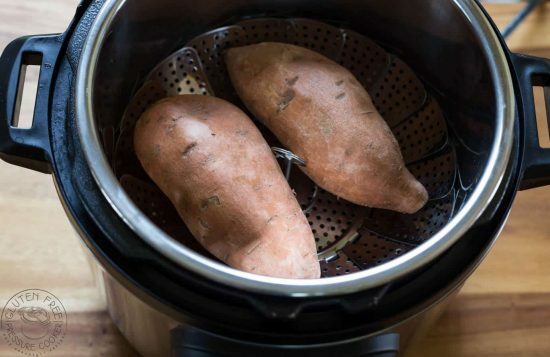 Add a steamer basket that is suitable for pressure cookers to the inner pot, then place in two sweet potatoes. 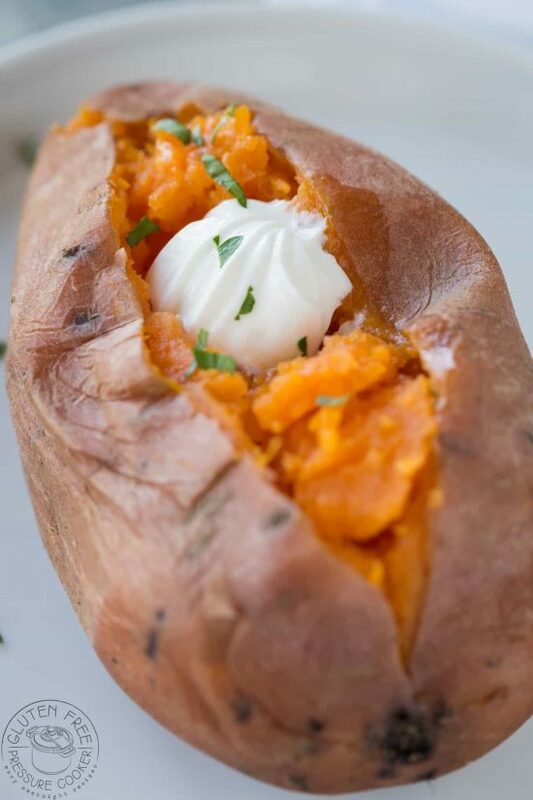 The cook time is variable and really depends on the size and width of the sweet potato, a fat potato may take longer than a skinny one that weighs the same. Lock the lid, turn the vent to 'sealing' and using the manual setting, adjust it to cook for 16 minutes for a medium potato at High Pressure. Refer to the chart in the post for other cook times. At the end of the cook time, you can release the pressure quickly and then carefully remove the lid. If the potato is not fully cooked you can either microwave it on full for about a 30 seconds to a minute and see if that is cooked enough (often it is) or you can put the lid back on and add on another minute or so under pressure, then release the pressure in the same way as before when the time is up. I much prefer them this way, it’s really easy! Do you need to poke holes before cooking? nope! 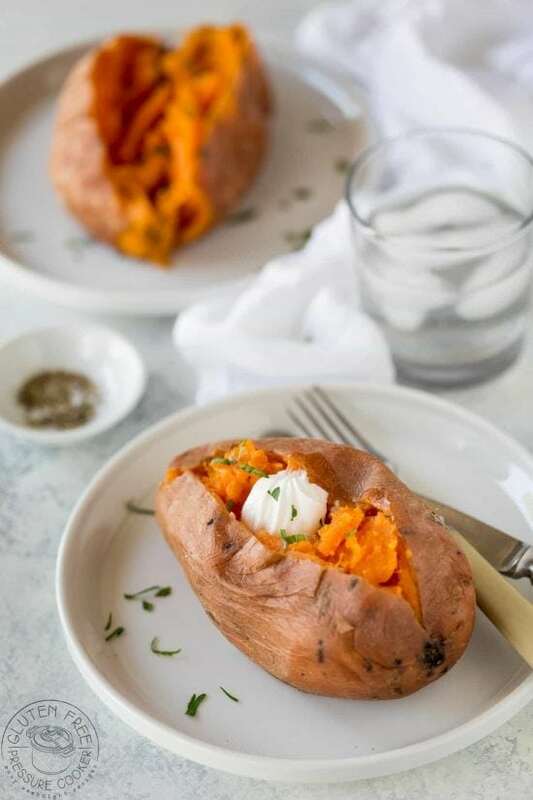 🙂 You don’t need to poke holes in the sweet potatoes before you pressure cook them, they will cook perfectly without doing that, it’s really easy!